FNA- The leader of Hezbollah al-Nujaba, a major Iraqi Shiite resistance movement fighting the ISIL, revealed that Commander of the Quds Force of the Islamic Revolution Guards Corps (IRGC) Major General Qassem Soleimani’s talks with different Kurdish sides prevented clashes and bloodshed in Iraq after the referendum in the Iraqi Kurdistan region. “The Islamic Republic of Iran’s efforts to resolve the issue (the problems after the referendum) and the presence of General Qassem Soleimani and his talks with all sides led to important achievements and peaceful settlement of problems, prevented bloodshed and kept safe the Iraqi people of all ethnic groups,” Sheikh Akram al-Kaabi was quoted as saying by the Lebanese Arabic-language al-Akhbar newspaper as saying on Sunday. He also explained about the Iraqi army and popular forces’ operations to take back Kirkuk after the independence referendum in the Iraqi Kurdistan region, and said that the Peshmerga forces helped them and the former gained control over the region peacefully. Al-Kaabi also blasted Massoud Barzani, the former president of the Iraqi Kurdistan Regional Government (KRG), for betraying Kurds and implementing the US and Israeli plots. In relevant remarks last month, Representative of the KRG in Tehran Nazim Dabagh revealed that General Soleimani had warned the Kurdish officials of the consequences of the independence referendum. “Mr. Soleimani headed meetings with local delegations (in Iraqi Kurdistan region). Mr. Soleimani also had several private meetings with Mr. Massoud Barzani, the president, and Nechirvan Barzani, the prime minister of the Iraqi Kurdistan region and the leaders of other parties, including Change (Goran) party,” Dabaqh said. He added that the Iranian side had warned the Kurds not to hold an independence referendum because all powers will stand united against the Iraqi Kurdistan region. According to Dabaqh, the Iranian side also told the KRG officials and Kurdish groups that Tehran wants the Iraqi Kurds’ achievements to be maintained within the framework of the Iraqi constitution. Also last month, Dabagh announced that the Kurdish leaders are now ready to resolve the problems created after the independence referendum through talks, lauding efforts made by General Soleimani to this end. “Mr. Soleimani is the one who has really treated the Iraqi Kurds honestly and he had issued warnings about (consequences of) holding the referendum in the Iraqi Kurdistan region before it was held,” Dabbagh said. “It seems that the Islamic Republic of Iran seeks to resolve the problems between the Kurdistan region and the central government in Iraq based on the Iraqi constitution and we assess Iran’s measures in this regard as positive,” he said. Meantime, a senior Kurdish Iraqi legislator praised General Soleimani for his mediatory role which led to the settlement of problems after the September 25 independence referendum in the Iraqi Kurdistan region. “Recently, after holding the referendum, a 9-article agreement was signed between Hashd al-Shaabi (Iraqi Popular forces) Commander Hadi al-Ameri and Bafel Talabani, a commander of the Patriotic Union of Kurdistan (PUK) (and son of late Jalal Talabani), under the supervision of Iraqi Prime Minister Haider al-Abadi and mediated by Qassem Soleimani, the IRGC Quds Force commander, based on which the referendum results were called off until an unspecified time,” Massoud Haider wrote on his facebook, Russian news agency Sputnik reported. Other Kurdish lawmakers were also quoted by Reuters as saying that General Soleimani met leaders from the PUK, one of the two main Kurdish political parties in Iraq and an ally of Tehran, in the city of Sulaimania the day before Premier al-Abadi ordered his forces to advance on Kirkuk. 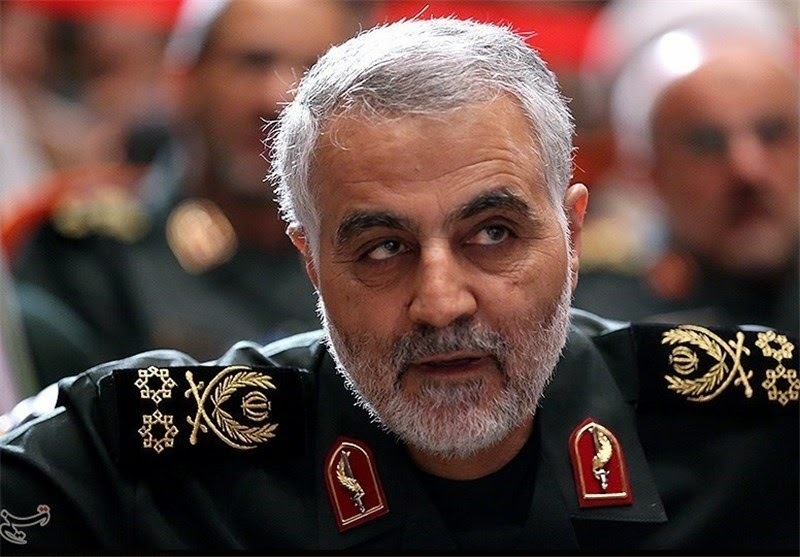 Reuters reported that General Soleimani told the Kurdish leaders that their Peshmerga forces would not be able to beat Abadi’s troops, which had backing from the West and regional powers Iran and Turkey. “Soleimani’s visit…was to give a last-minute chance for the decision makers not to commit a fatal mistake,” Reuters quoted one PUK lawmaker as saying. Ala Talabani, a leading PUK official, said the Iranian General only provided what she described as “wise” counsel in his meetings with Kurdish leaders. “Soleimani advised us … that Kirkuk should return to the law and the constitution, so let us come to an understanding,” she said on the Arabic language TV station al-Hadath.